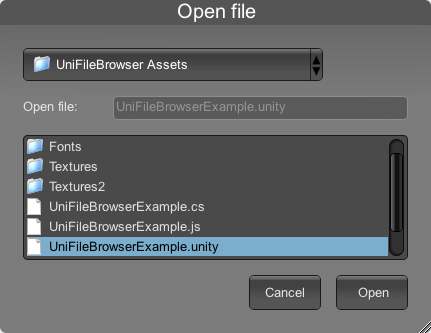 Everything you need for accessing files at runtime from within your Unity games or apps! Allow users to easily open or save files with a simple function call with this comfortable and functional file browser window. Can be skinned as desired, and the various GUI elements can be resized easily. Includes two demo GUISkins. Actions for opening and saving files, and opening folders. Filter files by extension, including multiple extensions. Can automatically add an extension when saving. Allow or disallow navigation to other folders. 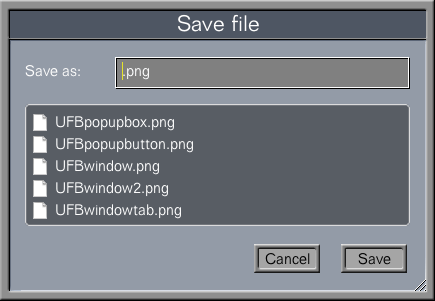 Can use multi-file selection, including shift for selecting a range of files and command/ctrl for adding/removing individual files. When saving, can prevent input of “illegal” characters that are not allowed in file names in common file systems. Can allow or disallow window dragging and resizing. Extensive API for full runtime control. Supports Mac OS X, Windows, and Linux; also works on mobile devices, with support for touch actions such as scrolling. UniFileBrowser requires Unity 4.6 or later (and works with Unity 5 or later, including Unity 2017). Several licenses are available to suit your needs, starting at US$9.95. Source code is included, works on most platforms including mobile. Note that UniFileBrowser does not work with WebGL, since security measures prevent WebGL from having local file access. See more feedback about UniFileBrowser and other utilities!